They first caught my eye in Hyderabad, but I couldn’t tell if I was seeing a fad, a pilot program or a sea change. 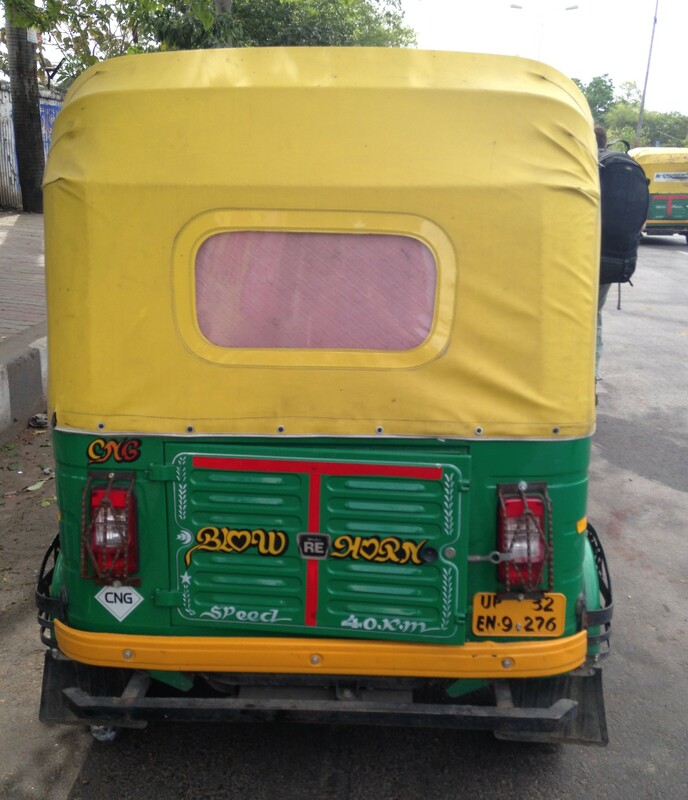 One of the green four-cycle auto rickshaws parked on next to the train station in Gorakhpur, India. The bicycle wheel just entering the picture provides a good sense of scale: these are tiny vehicles. Click the picture to enlarge. Ten years ago they were all black and yellow, classic taxicab colors. These three-wheeled transporters zoomed about, trailing thick steams of noxious blue smoke: they had two-cycle engines. They were chain saws with wheels. Today there are many more auto rickshaws and they still zoom about, but many fewer trail the blue smoke that reeks of unburnt petrol. A rear view of a green tuk tuk. In the lower left, down in the tailpipe, is a white CNG sticker indicating a cleaner fuel is begin used. Click the photo to enlarge. Now many are painted green and yellow. Part of the great South Asian Evolution is a change of fuel, from an oil-petrol mix to Liquid Propane Gas (LPG, what you use if you have a gas barbecue) or Compressed Natural Gas (CNG, what the Russians sell the Europeans for heating in winter). What’s driving this change in fuel? First and foremost: public health. The smog in urban South Asia–the cities have crushing density, high temperatures, and are not refreshingly breezy–was becoming lethal. There is still a great struggle for air quality in places like Hyderabad, Delhi, and Lucknow, but this fuel change is getting oil out of the air, slowing the growth of carbon emissions, and setting an example for countries like the United States who also need to change their fuel infrastructure. 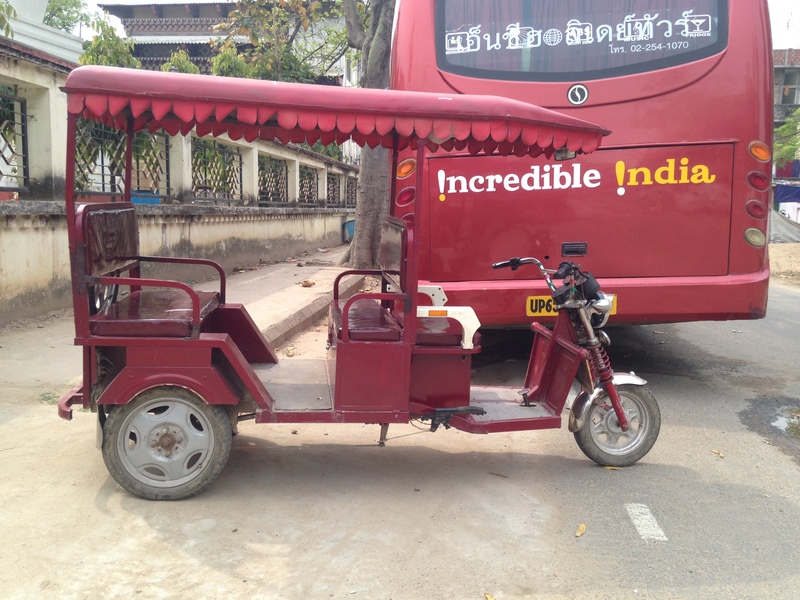 In Bodhgaya we were witness to another significant transportation change: the rise of the electric cycle rickshaw. The vehicle isn’t just a rickshaw with batteries strapped on. It’s a fresh design from the ground up, with local manufacturing and reuse as two of the design criteria. 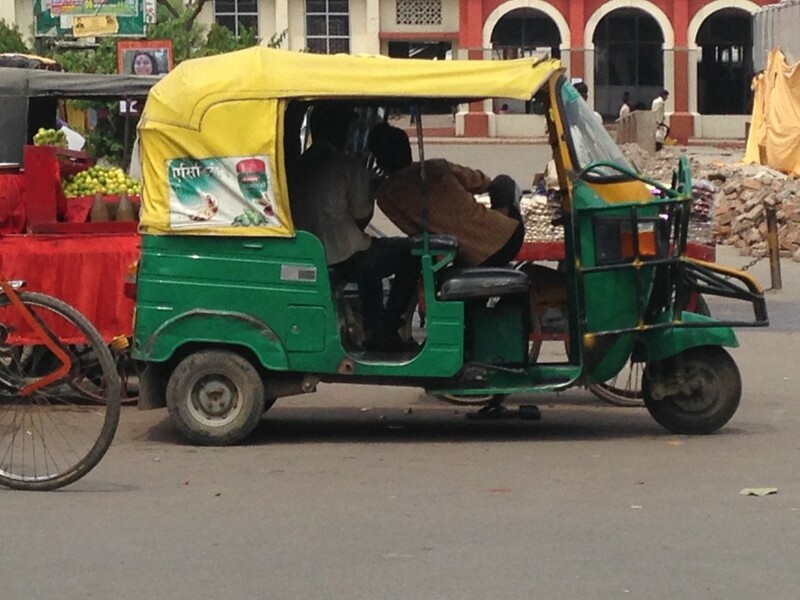 One of the new, all-electric cycle rickshaws parked outside a hotel in Bodhgaya. Note the extra, rear-facing passenger seat, which increases payload and battery storage space. The canopy is bigger and doesn’t obscure the view for taller passengers. Click the picture to enlarge. The front end is chopped off a classic, has-already-made-a-trip-to-the-junkyard motorcycle and welded to a back end that is visual departure from preceding generations of cycle rickshaws. The seats are integrated battery storage, and the cargo area is more open, allowing for greater payload and more flexibility about the shape of the payload. The mission of these electric cycle rickshaws in Bodhgaya is perfect for their rapid adoption: a whole lot of lightly loaded pilgrims want to travel 1-3 kilometers, moving between Mahabodhi temple and the temples representing each Buddhist country. The people of Kathmandu are also making the transition to electric vehicles, and what we experienced there is a hallmark of the social good that can come from changing transportation. What Kathmandu used to have was a fleet of heavy-duty, smokey, diesel tuk tuks that carried 8-10 people and ran on regular routes like tiny buses. What Kathmandu has now is that same fleet of heavy tuk tuks but with almost all of them refitted as electric vehicles. They aren’t as pretty as their Bodhgaya counterparts, but they’ve made a significant positive impact on the valley’s air. 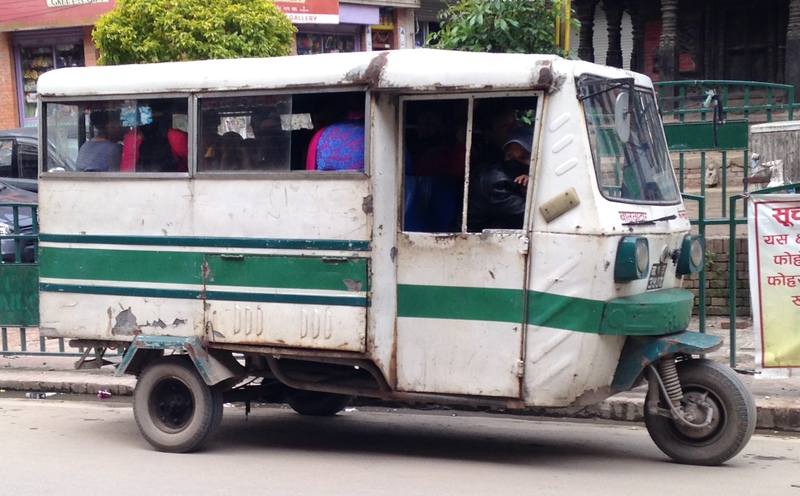 A SAFA tempo (The local term for Kathmandu’s heavier-duty electric three-wheelers.) loading up near Patan Durbar Square. A female SAFA tempo driver at work in Kathmandu. Her fate and the fate of her passengers is unknown. Click the photo to enlarge. Women are becoming professional drivers. 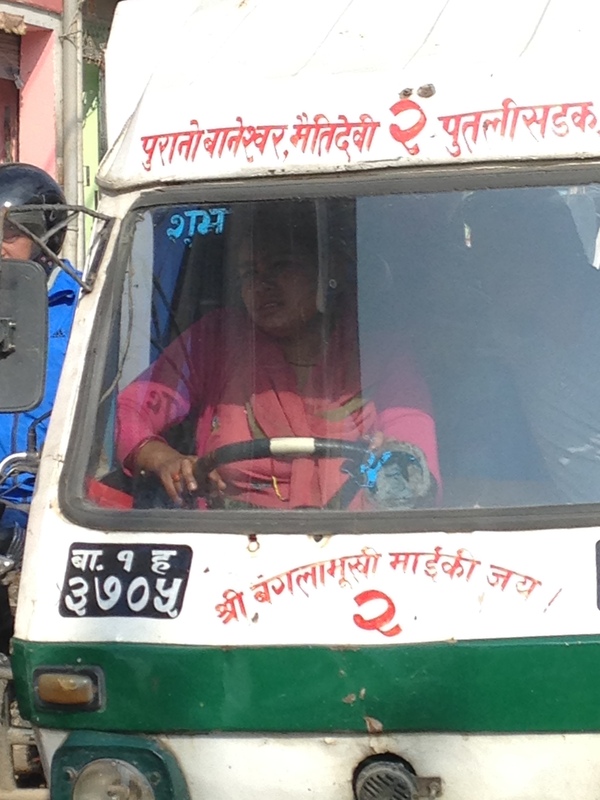 As of 2012, Kathmandu had 700 electric tempos on the streets and 200 women were part of that workforce. Governments and NGOs have formed partnerships with manufacturers and unions all over South Asia to open the taxi ranks to female cabbies. It is the lever of vehicle refits and fuel change that is opening this male-dominated workplace to the other half of the population.